Please follow these instructions to request an item for your visit to our Reading Room. If you would like to order photocopies or scans from our collections, please follow these instructions as the first step in ordering, even if you won’t be visiting the library. Then, you can continue from Step 3 in the instructions for Submitting a Duplication Order. Additional material can also be requested from the Alumni Records Index or Vertical File index. Please be aware that we do have material stored in an offsite facility. These materials require at least 7 business days’ notice to retrieve. We encourage you to place your requests prior to your visit. If you have any questions, please contact the Reference team at bentley.ref@umich.edu or 734-764-3482. We’re here to help! 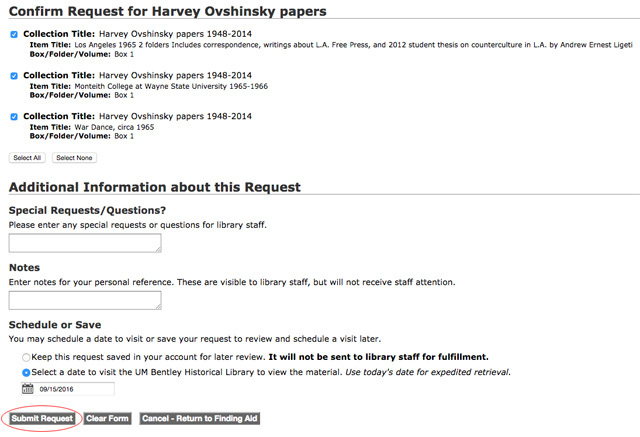 How do I Request Items from the U-M Library Search catalog? 1. Click on the title of the item for see more information. 3. If prompted, log in using your research account username and password. 4. Review your request information and click Submit Request. 5. For duplication orders, continue with Step 3 of the duplication instructions. 6. You will see the request in your research account and can monitor its status. 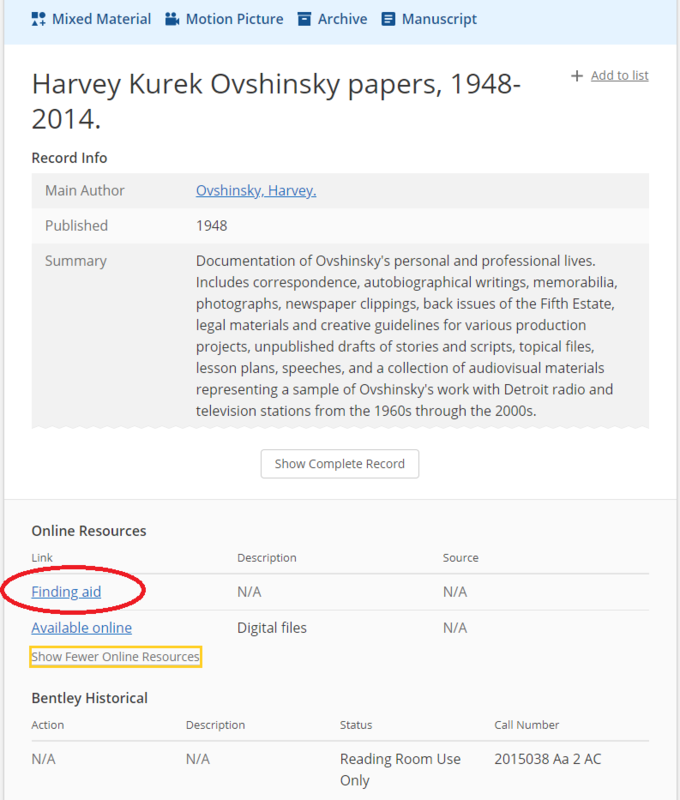 How do I Request Items from the Finding Aids? 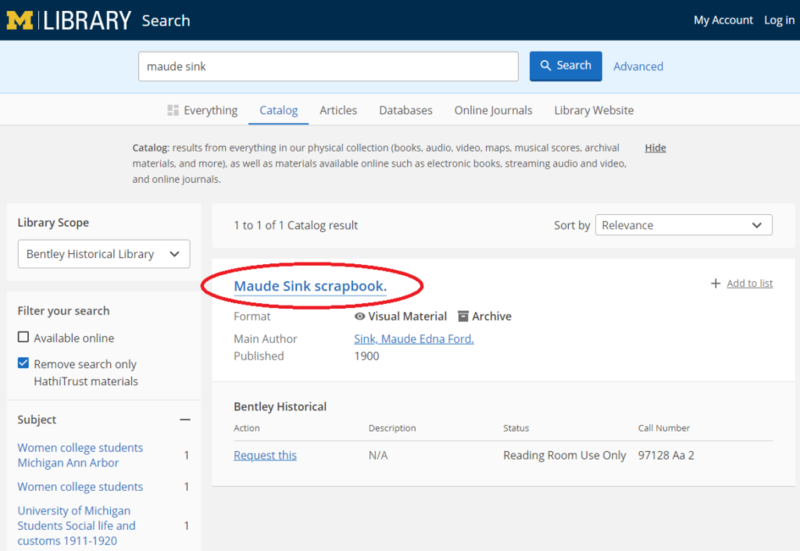 If you do not see a “Request this” link in the U-M Library Search result record, the collection probably has a finding aid (collection inventory). 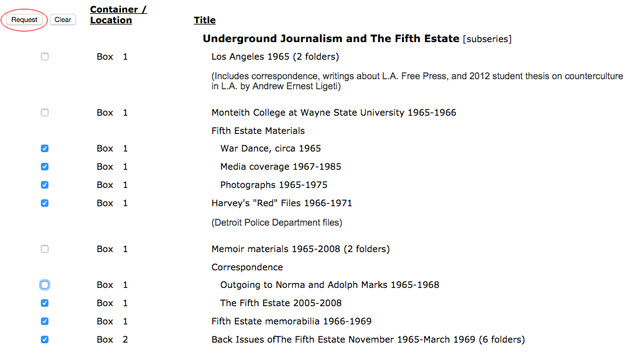 You can view the box/folder listing and choose folders in the finding aid. 1. Click the “Finding aid” link. 2. Click Contents List of a finding aid, select one or more checkboxes for folders you want to see (we will retrieve the entire box for you, even if you only select one folder). 3. For duplication orders, please select all folders that contain material you want copied. 4. Click the Request button at the top of the Contents List. 5. Review your request information and click Submit Request. 6. If prompted, log in using your research account username and password. 7. For duplication orders, continue with Step 3 of the duplication instructions. 8. 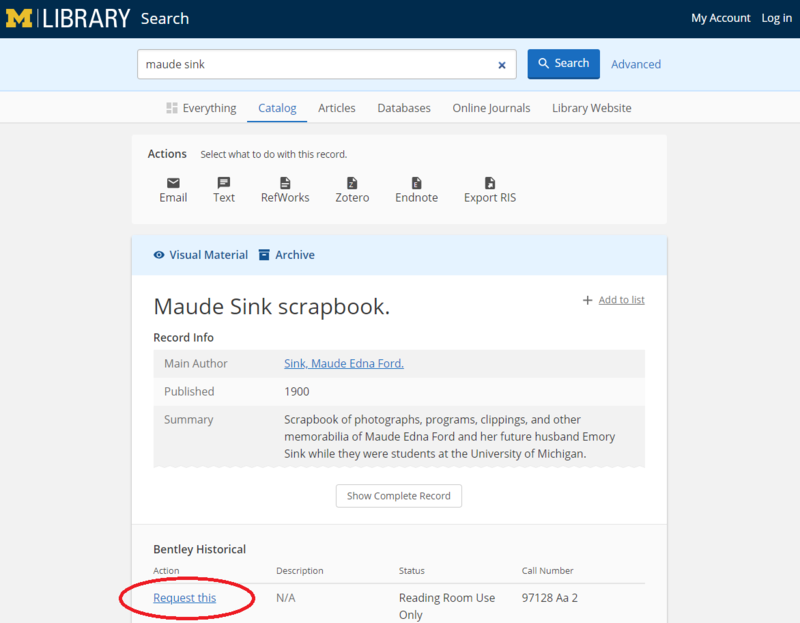 You will see your Reading Room request in your research account and can monitor its status. If you are requesting duplication of these materials, you’ve completed the first step of ordering your material! Please continue with Step 3 in the instructions for submitting orders, where you will list specific items, then select your delivery format and method. If you have any questions about this process, you can always call the main phone number (734-764-3482) and select the prompt for the Reference staff, or email bentley.ref@umich.edu. We’re happy to help!